Settling down in Kernersville — just about fully unpacked from the move. Nancy and I have started the process to become a foster/adoptive parents — we’re about 3/4 of the way to being certified. Started playing with a new band, Wax Mojo. Had a chance to sit-in with old band, Snake Oil Salesmen last month at The Nines in Ithaca, NY. Still working at Unifi, Inc. keeping the Linux systems under control, updating network wireless to comply with Sarbanes-Oxley standards, testing viability of cfengine as a management tool, and working with Xen and Vmware virtualization servers. Getting this site back on track and plan to start posting articles with more regularity. Thanks to Dan Cole, the host of WVBR’s “Tuesdays with the Band” program, we now have a copy of our broadcast interview from 29 January 2008. You can listen to the show along with photos from the studio on the Snake Oil Salesmen website here. 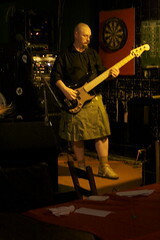 Here I am in my new Utilikilt at the Snake Oil Salesmen 16 Feb 2008 gig. We played at The Nines in Ithaca, NY and it was an amazing concert — I’m processing all of the audio and video and hope to get some things posted to the Snake Oil Salesmen website (ed: no longer in service) within a few days. The kilt was the birthday present mentioned in an earlier blog post. It is so comfortable to wear, I’ve already ordered a second one, and I’m planning to purchase a third. So far, I’ve done all my ordering from The Kilted Nation (ed: no longer in business) in Manassas, VA and they’ve been very responsive both in shipping as well as a few pre-sales support questions. I’ve got a conference (Internet Security Training Workshop) I will be attending in Virginia early next month and I plan to stop by their brick-and-mortar store when I get a chance. It was nice that the start of the RPM Challenge this year was at the start of a weekend. It let me give my attention to writing new songs without much distraction. My project, the “War Morgan Project“, is coming along. I’ve got bits and pieces coming together with either melodies or chord progressions defined for eight songs so far. I’ve got lyrics coming along for three songs so far. No names other than Logic Pro filenames for the songs so far; it looks like its going to be a mix of rock, jazz, and electronic styles. One website I found very helpful was the Hot Frets Progressionator which is a Flash application that generates sample chord progressions. I find it a nice tool to help me get started. I’m pretty happy with where I’m at with the project, between work and the upcoming gig with my band Snake Oil Salesmen at The Nines in Ithaca on Saturday, the 16th at 10pm, I’m not going to have much time to work on the songs until after that gig is finished. I’ve just finished signing up for RPM Challenge ’08. The goal is to complete one album with 10 songs or 35 minutes of original material recorded during the month of February. I set up a site for my project, the “War Morgan Project” — where I’ll post notes and media specific to the project. I’ve co-written a few songs with Snake Oil Salesmen, but never put out anything of my own, so this should be a fun experiment to get those music composition gears going.